The Moga Ace Power iOS 7 controller has an advantage when it comes to Made For iPhone (MFi) controllers: it's the one that looks most like something a gamer might actually want. It has everything important to gamers: two triggers and two shoulder buttons, two analog sticks (though they're really more nubs than sticks), and extra juice to power players' phones when they run out of batteries. With its plethora of buttons, it's already at an advantage against one of its main competitors, the Logitech Powershell, which lacks a second analog input and has only two shoulder buttons. But despite its obvious advantages, the Moga Ace Power iPhone controller is far from perfect, and it has some major flaws when compared with its other main rival, the SteelSeries Stratus. The Moga Ace Power may have everything that gamers need in a modern controller, but it's probably not going to win any design awards. Its cheap-feeling plastic body is one big part of the problem. Unlike the Logitech Powershell, the Moga doesn't have any fancy textures or rubberized grips. As a result it feels somewhat like a toy, despite its more robust capabilities. Of course, that's something the average iOS gamer may or may not care about. As long as it works, who cares if it feels a little cheap? But at $80, consumers might balk. The Moga's issue problems stem from its split design. The controller is two halves, which slide apart so you can put an iPhone in, but lock together only minimally when it's not in use. This means that the two plastic halves are constantly sliding and rattling loosely against one another, creating noise and moving around inside your bag or pocket. Not to mention that garish orange hue, which is just brutal on the eyes. Things get better when it comes to actually getting your iPhone inside the Moga Ace Power. The controller's halves slide apart easily, and then the left side ratchets just a little further, creating ample room to snap your phone into the lightning connector. Once the iPhone is in, a switch on the back of the controller prevents that left side from sliding away again, ensuring the phone stays in place and doesn't fall out while you're using it. 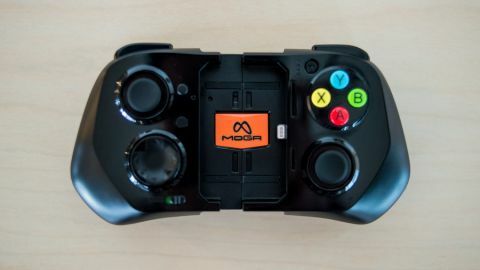 But another downside is that the Moga Ace Power is the biggest of the three main MFi controllers by far. The Logitech Powershell is much slimmer, while the Stratus is positively tiny. If you're worried about portability that may be an issue. The controls are where the Moga Ace Power blows its competitors right out of the water, especially the Logitech Powershell. And for many players who are willing to drop this much money on an iPhone controller, that's going to be the most important factor. It has a full suite of buttons: dual analog sticks, two triggers, two shoulder buttons, four face buttons (A, B, X, Y), a directional pad, and a pause button. There's also a battery status button that lights up four LED lights to show how much power the Moga has left, a switch that turns the controller's device-charging ability on and off, and a small button on the front-left that activates your phone's lock button. The dual analog inputs are arguably the most important part, and luckily the Moga Ace Power's nubs are excellent. If you've ever used a Nintendo 3DS you'll know what to expect, and it's high praise to say that the Moga's nubs are close to Nintendo's in terms of quality. Sadly the same can't be said for the rest of this iPhone controller's buttons. The d-pad is mushy and feels cheap, and the triggers have a bit too much depth, requiring too much time and force to push inward completely. The face buttons are workable, though they're certainly not exceptional. Same goes for the shoulder buttons, which are perfectly adequate but unremarkable. And the pause button is rather awkwardly placed on the left, whereas most players are probably used to having it on the right or closer to the center. Unlike the Logitech Powershell, with its awful analog D-pad, the Ace Power won't make your hands tired, even after hours of playing. Likewise you won't feel cramped, unlike with the tiny SteelSeries Stratus. Like the Logitech Powershell, the Moga Ace Power controller connects easily to your iPhone 5, iPhone 5S, or 5th-gen iPod Touch. Unlike the Powershell, the Ace Power is also compatible with the iPhone 5C. Unfortunately, any older devices, including the iPhone 4 and iPhone 4S, are left in the dust. And given the form of the Moga controller it's also not compatible with the iPad or iPad mini, unlike the SteelSeries Stratus. But if you have a device that does work with the Moga Ace Power, you'll find it simple and intuitive to slide the controller apart, snap your phone in, and get gaming. Whereas the Stratus requires a sometimes lengthy and often confusing Bluetooth pairing process, the Ace Power, like its competitor from Logitech, is pure plug-in-and-play. Moga's official documentation claims the Ace Power's battery lasts over 18 hours if you don't use it to charge your phone. We didn't test it for that long, but after about three hours of play and several minutes of charging all four of the controller's battery status LED lights lit up still. Moga concedes that battery life will vary if you're using the Ace Power to charge your device while you play. It's difficult to find a comprehensive list of all the games that are compatible with iOS 7 MFi controllers in general, much less for specific controllers. Even the lists put out by the controllers' makers aren't updated frequently and rarely actually include all the games that are compatible. There is, however, a helpful third party iOS app called Game Controller Apps that lists exactly which games are compatible with MFi controllers. Using the app it's easy to see all the high profile games that support the Moga Ace Power, including Angry Birds Go, Anomaly 2, Asphalt 8, Bastion, Call of Duty: Strike Team, Dead Trigger 2, Edge, FIFA 14, Grand Theft Auto: San Andreas, Jet Car Stunts 2, Limbo, Minecraft, Oceanhorn, Real Racing 3, Knight of the Old Republic, Sonic 2 and Sonic Racing, The Wolf Among Us, Tomb Raider, The Walking Dead season 2, and dozens of others. Games that require two analog inputs to be properly played show off the Moga Ace Power's strengths. Playing Minigore 2: Zombies and Dead Trigger 2, two very different zombie shooters that share the need for a second analog stick, is great with the Ace Power. Playing first-person shooters has never felt right on a touch screen, but thanks to the Ace Power (and its SteelSeries rival, which also has dual control sticks), that's no longer the case. Dead Trigger 2 feels even closer to being a full console game when you're using physical controls, and the Ace Power is perfect for it. Even games that don't require two analog sticks benefit from the Moga controller's responsive analog nubs. It's easy to steer in driving games like Angry Birds Go and Asphalt 8, and even a smaller game like Death Worm benefits from the physical controls. When the analog inputs are this good, they're the best option in any game, from Joe Danger Infinity to the classic Sonic the Hedgehog 2. Every game we played with the Moga Ace Power felt better than playing with touch screen controls. The Moga Ace Power iPhone controller has every button that modern gamers expect, and its dual analog control nubs in particular are impressively responsive and useful. Every game feels better with the Ace Power than with touch screen controls. In addition the ability to charge your phone while you're using the controller is great, and the Moga's battery life appears to be impressive as well. And it's nice that your device's lock button is still easily accessible and that the Ace Power is compatible with the iPhone 5C. There are plenty of games available for it as well, and more and more are being updated with MFi support all the time. Unfortunately Moga skimped a bit on the Ace Power's build quality, and its rattling, jangly plastic will likely get on some players' nerves. In addition, some of the buttons, including the directional pad and the triggers, are not up to snuff. That makes it hard to part with a $80 for this controller. It's also a shame that the Ace Power is only compatible with iOS devices equipped with lightning connectors, though you can't really fault it for that against its competitors since that's true of Logitech's and SteelSeries' options as well. However, the SteelSeries Stratus is also compatible with iPads and iPad minis, which gives it a leg up compared to the Moga Ace Power. The Moga Ace Power is ultimately a solid choice for iOS gaming enthusiasts who don't mind jumping on the MFi bandwagon a bit early. It's certainly a much better choice than the Logitech PowerShell, and now that Moga has dropped the price from $99 to $79 it's a no-brained if you're choosing between the two. As of this writing not every outlet has this updated price, so make sure to shop around so you don't overpay. However, if you can get over the SteelSeries Stratus's minuscule size, that controller provides many of the same benefits as the Ace Power, with the added bonus of iPad and iPad mini support. So it comes down to this: would you rather have a larger, plastic controller that turns your iPhone into a Game Boy, or something with bluetooth for greater iOS versatility?